WordPress vs. Medium: Comparing Apples & Oranges? While the speedy Hare bragged about its lightning pace but snoozed mid-way, the slow Tortoise, moved steadily, without looking back, and won a mighty winning. We learn perseverance and ingenuity are important determining characteristics of a leader and a winner. Not speed or how much ahead one has gone. The Hare & Tortoise fable is not an unfamiliar story to any of us. It teaches a timeless lesson, and unsurprisingly, explains many real situations and characteristics that apply beyond people. It can also be applied to non-living things that also run, albeit figuratively, compete with each other, and even move our lives in productive ways. Two such creations are Medium & WordPress. Two giant web blogging platforms that are different in several ways. 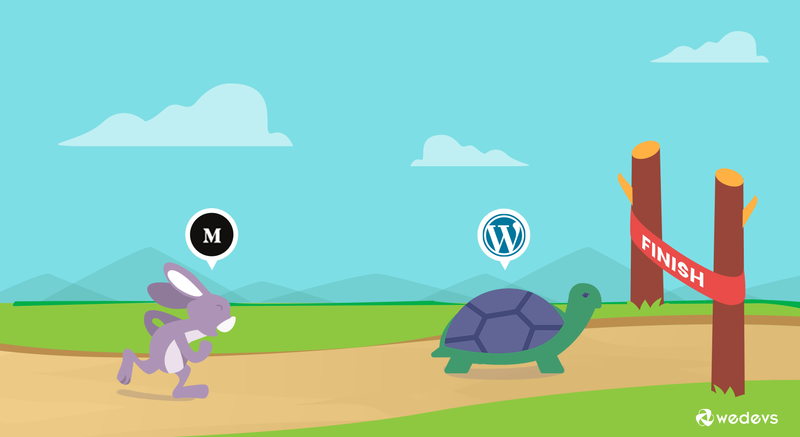 As you may've guessed rightly, this article will be going over the differences between Medium and WordPress, the two heavy hitters in today's content writing platform industry. To avoid the hassles of having to migrate to another platform later, you must research thoroughly and cross-match your needs with the services offered in each platform before making a choice. If you're simply looking for a blog that's easy to set up and doesn't require coding skills, both WordPress and Medium are good choices. Both are well-known as amazing blogging platforms. So it's not enough to only consider ease of use. If you want a hobby blog, news or other professional site that you can own, make it your personal space, modify anytime, where you can incorporate brand identity & individuality & have a customized web link, then WordPress should be your choice. In WordPress, you've the freedom to build anything you want. If you want to get started right away without any costs and the room to customize or grow, then Medium is your likely companion. Unlike WordPress it doesn't require a domain (about $14.99/year) and a hosting (usually starting from $7.99/month) to get started. Which also means you don't own what you post! WordPress, the software, itself is free though, which you get from WordPress.org. Disclaimer: Let's not confuse the two versions of WordPress. There are lots of differences between the Self-hosted WordPress.org & the Managed WordPress.com. Having said all that, let's dive into the differences between the two best blogospheres for all types of users. Medium was launched in 2012 as a free online content publishing and easy-to-use blogging platform with an algorithm that delivers great stories directly to readers' feeds. It has an established audience of avid readers and a community of writers, bloggers, journalists, publishers, and experts. The platform allows you to reach an existing online community of readers who are on the constant lookout for fearless writing. It's a great place for experimenting with ideas, be weird, and take risks. You can write your own stories, have people reading it, and get rewarded. It's a place for writers with fresh, authentic voices. Has a great import tool that lets you import content from anywhere in the web. It automatically links users with their social network connections. Gives you 30-day stats on how many people read your stories and how many read it till the end. Lets you write series and create your own publication. The built-in features are very limited in terms of design or building a brand. And since it's not an open source software, you won't have customization facilities. The Medium corporation owns your audience, so losing your blog means losing all your followers. You won't have a custom domain to showcase. All your writings are hosted and stored in Medium's server. Claps matter – it's all about how many people clap on your post. If you can get about 50 claps or more within 24 hours, you will likely be one of the top stories of the day. Those top stories get featured prominently on the website and in the app. WordPress.org is the world’s most popular blogging software and also a complete site development and management system. It is also open source so you have room to grow the way you like. The host of plugins and themes (over 50,000) makes it easy to design a full-fledged website, not just a blog. WordPress pages are responsive and mobile-friendly in portable devices. And this is important since a large number of internet users browse on mobile. Because WordPress is open source, developers can open share code online. This saves a lot of time and costs on the part of programmers who can share existing code. You can write long-form SEO optimized posts. Create pages and posts using a variety of fields, custom post types, meta fields, templates, etc. Secure your posts and pages from spammers, hackers and bots. Optimize images, create backups of your data and increase the speed of your site. Redirect your users to changed URLs you like even if you redevelop your entire site. Even though WordPress doesn't require technical or coding knowledge, a little bit of web development and marketing knowledge always helps. Basic knowledge of HTML and CSS will make things a lot easier. It is also good to pre-plan how you want to create your site and move forward. Medium is a lot like Facebook, Twitter and LinkedIn where people discover content randomly with the highest number of shares, likes or comments. If you publish an article for the first time, it gets difficult to get reach unless it's a viral type of content. Content syndication is a method of republishing content on other sites in order to reach a broader audience. Syndicated content not only increases your reach and brand awareness, it also builds links and can help drive more traffic to your original article. Syndicating content doesn't require one to create original or new content. With minimal effort, republishing existing content helps users to gain traction and grip over their audience. But then again, there are only certain topics that do great on Medium, and others that don't do well at all (more on this below). In Medium, if you've to get a good reach, you've to use social networks, ask your fans to read your content, and aim for topic<>channel fit. WordPress at its core has been a content and site development platform. Even though WordPress started off as a blogging site for beginners and advanced users alike, it went on to become something much more. WordPress has always been focused on content-makers and as it grew, it did so while pivoting on its content managing capabilities. WordPress today is darn accessible, extensible, scalable, and secured. Bloggers use it to fulfill all their digital communications needs and create innovative structures out of it. This origin, focus, and usability makes WordPress super appealing to users coming from all walks of life. Anyone can install and set it up without the use of tech manuals. And it's super easy to start a blog or website on WordPress even for the 60 year old IT employee, the hobbyist chef, the teenage music enthusiast, or an old marketing firm. This also means that not every type of content will get the same amount of exposure in Medium. Readers on Medium are mostly interested in the topics listed above. Moreover, for each story, Medium gives you a list of topics and the percentage of your readers that follow that topic. This helps you decide what you want to write about next and also check if you're reaching your intended audience. This questions whether it's really easy to write about anything in Medium and still get the same about of attention. As mentioned above, because the amount of exposure you get is dependent on the number of claps you get, you're left to do a lot of the background work on your own in order to get your content to the forefront. As reported by many authors, if you're not someone who has a large number of social network connections, you're in hard luck to get your story at the top of readers' news feed. With Medium the maturity of your content hardly matters in comparison to claps. The amount of time that has passed is also not proportionate to the chances of your story showing up in readers' feeds. Medium stories also take much longer to appear in Google searches. This does cost you a lot, especially if you're running trying to bring in conversions or engagement for your business or bring more visibility to your blog. If you're an infrequent poster, that may cost you even more time. If you're not targeting a high volume keyword with a strong competition, you are better off publishing on your website. And you would rather have people visit your website, spend time there, and take a meaningful action, than read a content on Medium. Since WordPress is greatly optimized for SEO, and also powered by a number of simpleton SEO plugins, it's easier than even to write any write any type of blog and still get eyeballs in your site and blog. Writing log-form content with focus keyphrases, meta tags, description, and important keywords pays off in the long term. So if your content doesn't attract a lot of clicks immediately, do not lose hope! WordPress sites are naturally optimized for search. And as your pages get indexed by Google's algorithm, you're for sure to bring in a lot of clicks, increase the time user's spend, and keep your audience hooked, if you've done everything else correctly! Best part: WordPress blogs and pages get indexed in Google really well and quite fast. And the more you update your content, the more likely it is to appear as a top search result, almost near real time! The absence of ownership of a custom site and domain precludes users from branding on Medium. Though Medium allows you to change the title of your story and customize the title, subtitles, and description for social media, it still doesn't feel like you're branding. Because the platform is simply not for creating product or service awareness. You can only edit the slug, but the main domain still remains of Medium itself. Writing on Medium feels like doing branding of the platform itself than of one's own creations. It's also very easy to get taken over by other brands and authors on the Medium network where others' stories are constantly displayed side by side or next to yours. Thus taking away your audience. With Medium you get an easy to use layout where you can add your logo and image. The visual editor is very easy to use and offers several stylizing options. Having said that, the Medium visual builder is still very limited. Users cannot import their own designs and layouts for their own space. The lack of controls afforded by Medium is a major drawback. With WordPress you've full control over your WordPress site and also on how you want to brand your site and content. With a WordPress site, your content and business will always be advertised with your name. There's also a lot you can do on WordPress to increase the time visitors spend on your site and to keep your site squeaky clean and professional. You can control who can interact with your site and how. WordPress even allows you to monetize your site and earn from your site! You can always decide how to leverage your content and brand recognition and capitalize on it. As for designing, WordPress offers a host of themes and plugins that lets you customize your website as you like and make it unique. These are sufficient to give you a professional appearance and you can customize the options unlimitedly. Because WordPress is open source, and that's the beauty of it! Medium is a social network at its core. And social media platforms are designed to showcase content that are mostly based on how interesting, funny, or entertaining they are and how viral they have been in the community. In other words, social platforms are not for those who are ‘actively' looking for a certain kind of content. What you watch on your feeds is based on discovery of contents having the most thumbs up or shares, and what people get hooked into is essentially random. We open up Facebook and LinkedIn without specific intent. We just want to learn a little or be inspired or see what people are talking about. So these platforms want to deliver the best of content – the kind that will keep you hooked and coming back…To do this they use algorithms that automatically surface content getting the most likes, shares, comments, etc. And that's why it gets difficult to get reach on Medium. Because on Medium, the algorithm is driven by claps, which takes a lot of promotional effort to obtain. The more claps you have the more you reach readers and the more likely you're to appear on other people's feed. This also takes us to the fact that there's not much you can do for SEO on Medium. Whereas, WordPress is widely known to be SEO-friendly. Medium cannot be used alone if you want to optimize your content for search. Medium is not known to be optimized for SEO from its core like WordPress pages are. Medium’s high Domain Authority of 92 lets stories containing high performing keywords with to come up top on Google searches even if they're high on competition. In other words, if you're targeting search terms that are highly competitive you are more in luck if you publish on Medium. But even then, you would have to build a lot of backlinks and promote your stories to stay on top. And at the end of the day, if you're seeking conversions or engagement, you should more likely consider making these efforts for your website than for Medium content. Moreover, the absence of plugins like the built-in Yoast SEO for posts and blogs makes it even more difficult to do it manually insert keywords and attract custom audiences that you want to grab attention of. WordPress, on the other hand, is not a social network. The contents on WordPress.org are completely of the author's and the owner of the site. Which means what you come across on a WordPress site is essentially what you have found through search engine results, backlinks, ads or through mentions and references. But it's also the case that WordPress contents are found when users are actively searching for something particular. WordPress is search engine friendly, which means pages and posts written on WordPress are continually indexed on Google. In other words, WordPress is a content network where blogs and websites are found through searching for key terms and specific topics. With Medium, users get a massive online community for free with built-in social networking features. However, with Medium you do not own anything. You wouldn't get a custom domain that works like your personal website page. Everything you write on Medium is owned by the corporation itself. On the other hand, WordPress lets you own your own website which you can run smoothly with a customized domain. And since you buy your own hosting, you'll have full control over every aspect of your website, your information and data, which you can store, edit, delete or share as you like. Moreover, with WordPress, you can create a variety of websites like forums, online marketplace, membership sites. Thousands of free and premium themes makes it plausible to design a website that uniquely applies to you and stand out from the rest. And thousands of plugins work like extensions and apps to add all kinds of new features and extend existing ones. You must remember, however, that managing your own website comes with a learning curve and you will have to take the responsibility to manage your own backups, updates, and security. One advantage of Medium is that the in-line text and page formatting toolkit and visual builder gives you a live preview while you're writing to show how your final content will look on the web. 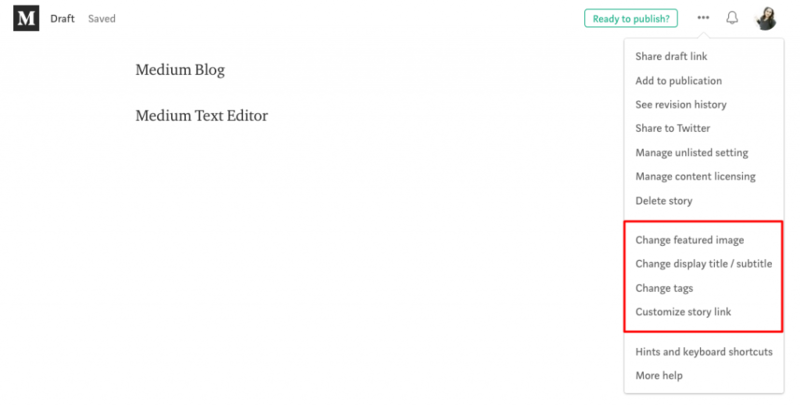 The Medium editor is popularly liked because of its ease of use, clean layout, its ability to configure image sizes and align text and images in a variety of ways, and its way of making writing free of distractions and incredibly simple. The platform gives a homely feel so that writers can delve into stories, analysis, reports, opinions, and memoirs, without feeling constrained or chained and without the fear of being judged. Because in Medium writers get rewarded for their unique, original and out of the box perspectives. It's an ad-free home for curious, avid readers who want to be inspired. In depth and nuanced pieces are the target instead of focus keywords. There's no pressure to deliver or hit target goals or even try to ensure that the content has done its SEO well. With the new version of the core, the 5.0, and the addition of Gutenberg visual builder, the WordPress editor is now no less than Medium. Even though the classic editor has been a favourite of WordPress users and sufficient, the recent development to Gutenberg has added real-time previews, drag & drop ability, and block-form builder for a transformed user experience. This is the first revamp and significant development of the WordPress editor since the inception of the CMS, and it is already changing the way users experience how posts and pages are edited in WordPress. 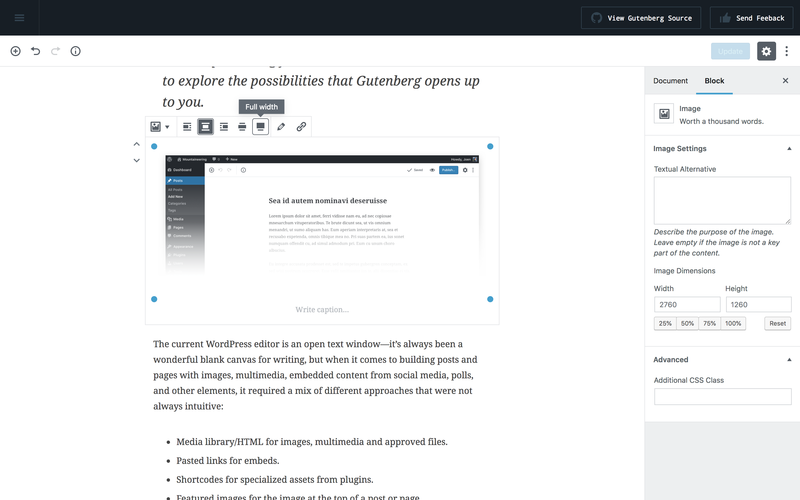 Gutenberg has the same capabilities like the formatting options in the current classic editor, but it also adds a bunch of new features never experienced before in WordPress. Gutenberg not only improves the user experience better than the Classic Editor, but it also gives users more control over the end result so they can build their websites and blogs just like they desire. It is also built to be dynamic, flexible and extendible so themes and plugins can add their own blocks with custom functionality and layout for posts and pages. With the block editor, each element in the content of a page or post is a block – paragraphs of text, images, videos, block-quotes, lists, galleries, tables, and so on. And unlike Medium, blocks can be dragged and dropped anywhere in the content, added and removed as require. Every block has its own formatting settings that are unique for its function. The overall setup of every block is clean, easy to understand, and doesn't make the interface look overwhelmed and cluttered. But it's also advanced enough, so you can create and edit blocks in a variety of ways, e.g. widgets, embeds, Yoast data blocks, Jetpack elements, and even insert forms, codes, maps and custom HTML. If you don't like the pre-built settings, you can add CSS class to customize. It's been anticipated that the block concept will eventually replace widgets and menus in WordPress as well, and that blocks will play a huge role in the future of WordPress. Going back to our introduction story, we see that the slow Tortoise one who took it steadily gains victory over the speedy Hare. When we apply this fable metaphorically to Medium and WordPress we find a similar connotation. Medium is best if you're looking for a super quick way to get started with your blog, without thinking about anything else. It's great if you don't need a custom link, only want to focus on writing, have to compete constantly with other top authors to get to the feeds, don't mind losing your followers and shares if the platform shuts down some day, and don't mind taking the extra effort to promote your content to get noticed. WordPress is ideal if you're thinking of getting the whole package – creating & managing a blog as you desire, growing it into a full-fledged website now or later, having your own audience that you will never lose, and even earn from the content if you ever want to. An all-in-one! While it may take a learning curve to hang along with WordPress, it does pay off vastly in the long term. WordPress lets you ‘become' something by letting you create, innovate, invest, and own it all. You can develop your passion or profession from scratch and invest on it just the way you create and nurture your own home. A home that ‘belongs' to you. And it certainly does take a little while to make a home. But you can dwell in it and cherish it forever. No wonder then the slow and steady one wins the race! Medium and WordPress are giant blogospheres and unique in many aspects. It's great to use both. Use WordPress to have your own space, and Medium for content syndication to create a new reach. This article has been an overview of their exclusive features and what sets them apart from each other. And while it may sound clichéd but it's a fact – what works for others may not work for you, and what works for you best will depend on your needs. Wonderful comparison and nicely presented. Is this article posted on Gutenberg editor?